A small group of determined visionaries on a mission to resurrect a species of prehistoric bovines, called aurochs, which have been extinct for centuries. The 21st-century back-to-the-farm movement stems from our yearning to escape the artificiality of modern urban life. Yet the domesticated plants and animals now found in most gardens and farms are themselves artificial, the results of extensive human meddling, cross-breeding and genetic manipulation. Mankind began engineering what we now call “farm animals,” including cattle, all the way back in the Neolithic period, between 10,000 and 5,000 B.C. Try as you might, you won’t find an untamed Jersey cow that originated naturally in the wild, because no such thing exists — just like there’s no such thing as a wild labradoodle. Cattle are entirely human-made, molded over thousands of years from long extinct, ancestral species. A small group of determined visionaries are on a mission that seems ripped straight from the plot of a (farm-obsessed) sci-fi novel: Resurrecting a species of prehistoric bovines, called aurochs, which have been extinct for centuries. 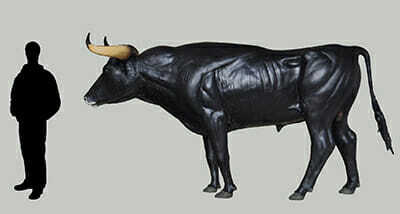 Wild aurochs were bigger and leaner than domesticated cattle. Centuries of human intervention and selective breeding gradually transformed them into docile, milk-heavy dairy cows and beef cattle. Most Americans have only ever heard of aurochs when name-dropped in Game of Thrones, and likely assume they’re mythical creatures. Not only were they real, they were once dominant: million-strong herds thundered across Eurasia and North Africa. 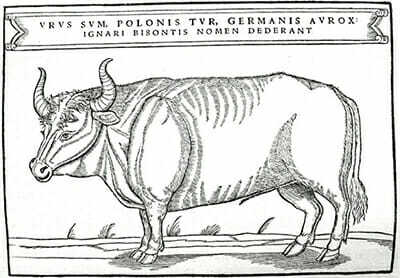 Sadly, The last recorded aurochs perished in a Polish forest in 1627. The quest to resurrect aurochs dates all the way back to the 1920s. Two German zookeepers, the Heck brothers, tried to recreate them by back-breeding various types of 20th-century cattle thought to possess aurochs-like characteristics. By the 1930s, the Hecks had declared success, but the resultant animal – now known as “Heck cattle” – were only vaguely reminiscent of actual aurochs, and much smaller. The possible great-great-grandparents of the future aurochs; three Chianina cows and one Watusi bull from the first Uruz Project breeding herd in Lorsch, Germany. / Courtesy Claus Kropp. The foundation animals of a future Uruz Project herd being transported to their new home. / Courtesy Arend de Haas, True Nature Foundation. Fast-forward to 1996, when a new group of German researchers picked up where the Heck brothers left off, cross-breeding Heck cattle with yet more ancient-looking bovine breeds from Italy and Spain. This new crossbreed was eventually dubbed “Taurus cattle,” and was a step closer to aurochs – taller and bigger, with a more aurochs-like snout. Things started to go a little haywire after 2003 when Taurus herds were also established in Hungary, Denmark and Latvia, each of which began to introduce its own idiosyncratic variety of breeds (African cattle, Holsteins) to the genetic mix. 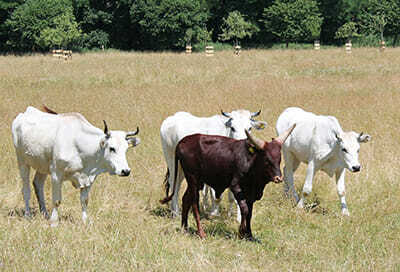 While Taurus cattle are definitely more aurochs-like than Heck cattle, by now there is no consistency. Now the Dutch are leading the way in this race backward to the pre-domesticated past. Tauros researchers wiped the slate clean and started fresh with no genetic contributions from Heck cattle or other artificial crossbreeds, instead launching a scientifically based attempt to coax the aurochs phenotype from ancient DNA deeply embedded in the genes of a cadre of “primitive” cattle breeds still surviving in southern Europe. Tauros researchers compare the genes of existing breeds to that of the aurochs, whose DNA has been sequenced by the University of Dublin from bones found in Britain, and use that information to help them breed backward for the right characteristics. Uruz Project ecologists assessing a possible aurochs habitat with local farmers in southwest Romania. Credits: Arend de Haas, True Nature Foundation. “Our goal is not only to have an animal that looks like an aurochs but also genetically comes as close as can be,” says Goderie. Tauros is not alone in this quest. In fact, there is a bit of drama in the world of aurochs de-extinction. 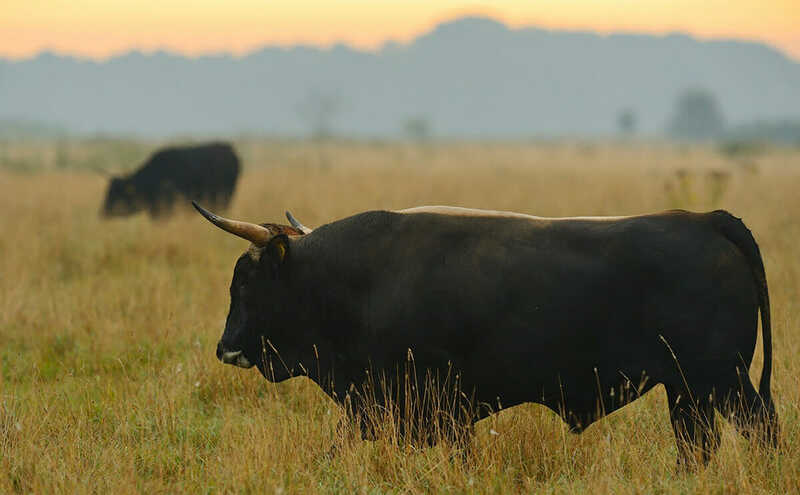 A brand-new Dutch aurochs venture, the Uruz Project, was recently launched by Henri Kerkdijk-Otten, one of the original Tauros researchers who left and started his own initiative over disagreements about the best way to breed back aurochs. Of course, Kerkdijk-Otten cautions, even a carefully reverse-engineered aurochs will not be an exact copy of the beast that once existed. “But neither would a suriving wild aurochs be, if the species had survived till today. The purpose of the Uruz Project is not to replicate some outdated stage of aurochs development, but to be an aurochs for the 21st century,” he says. On the walls of Lascaux Cave in France, in the Upper Paleolithic era (around 17,000 B.C. 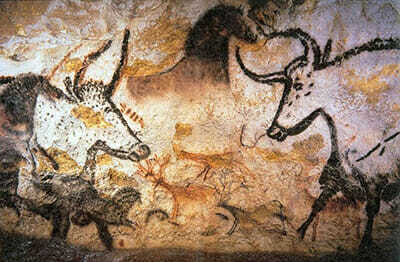 ), early humans painted aurochs, which they hunted. / Courtesy Prof Saxx. An illustration of an aurochs from a book published in 1556 by Sigismund von Herberstein; the Latin words mean, 'I'm an aurochs.' Since aurochs were already a critically endangered species by 1556, the illustrator might never have seen an one, as the drawing's proportions (hindquarters too fat, legs too short for a real aurochs) aren't entirely accurate. A lifelike model of an aurochs next to a human figure for size comparison. / Courtesy Pachyornis at the Breedling-back Blog. So, is there a future where diners are chowing down on farm-raised aurochs burgers? But let’s not forget why we aren’t farming aurochs today: they produced less meat and less milk than modern breeds. The entire purpose of the domestication process was to develop an animal with maximum food and power output. The entire purpose of the domestication process was to develop an animal with maximum food and power output. The real goal of the aurochs de-extinction movement is to re-introduce a wild species, not create a gargantuan, uncontrollable, sinewy farm beast. The Tauros Programme, working with Rewilding Europe, already has hundreds of second- and third-generation crossbreed cattle in Spain, Portugal, Croatia and the Netherlands, and its researchers are optimistic that within another few generations a new aurochs type will emerge from their experiment. Uruz, for its part, is just setting up its initial herds, the first of which lives in the town of Lorsch, Germany at the Lauresham Open Air Laboratory for Experimental Archaeology on the grounds of a medieval abbey, where they’re tended to by historian Claus Kropp. Another herd grazes in the Dutch town of Breda, with more planned soon for Romania and Spain. But what about the ultimate de-extinction dream – cloning? Sadly, Steven Spielberg will not be releasing Jurassic Farm anytime soon: although the ancient aurochs DNA has been sequenced, the necessary ingredient for cloning ”“ viable tissue samples from fresh aurochs meat or blood – has long since disappeared. Some hope that viable DNA may be extracted from preserved bones and horns, but such technology does not exist at this time. For now, even the most high tech geneticists must do things the old-fashioned way: Through the careful selection and breeding of the aurochs’ living descendents – if we are ever to hear those heavy hoofbeats again. Top photo: A first-generation Tauros bull named “Manolo Uno,” who is a cross between an Italian Maremmana primitivo bull and a Spanish Pajuna cow. / Courtesy Staffan Widstrand and Rewilding Europe.